I’m a complete dumb when it comes to game art. As a programmer I feel incredbly challenged by the complexity of this task. And don’t doubt it, the art department makes a big difference in any game project. I’m not going to make a complex essay about the subject. If you want nice information on game design and art, take a look at lostgarden.com. But I’ll touch this subject, even being a game programmer “only”. 3 – Do simple games that fit your artistic skills. 4 – Learn the basics and do it yourself. What? How can an artistically chalenged technitian monkey learn how to assembly game art? 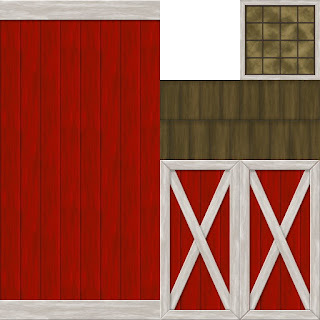 I managed to do this texture for a barn without the use of a single real world picture and now I’m quite happy with other results I achieved in my new learning curve. If even a programmer like me can do the job, so nobody should feel limited in any way. Go try it out!